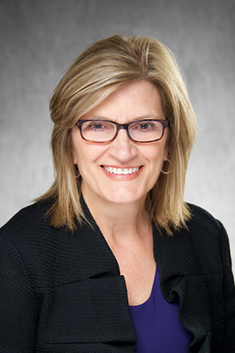 Jody Kurtt, MA, RN, NEA-BC, CPNP, is director of nursing and patient care services at University of Iowa Stead Family Children’s Hospital. She grew up in Denver, Iowa, and has spent most of her career at UI Hospitals & Clinics and UI Stead Family Children’s Hospital. She earned a diploma in nursing from St. Luke’s School of Nursing in Cedar Rapids, Iowa; a bachelor of science in nursing from Coe College in Cedar Rapids, Iowa; and a master of arts in nursing from the UI, concentrating on nursing administration and children’s health. In addition, she is a certified pediatric nurse practitioner. In high school, I knew I wanted to work with children. My senior year, I confirmed my plans for nursing school after exploring other options. When I completed my BSN at Coe College, I joined UI Hospitals & Clinics as a pediatric nurse. After working at UI Hospitals & Clinics for 10 years, I moved to Cedar Rapids to develop a new nurse role in the Cedar Rapids school system at Metro High School. I taught classes and assisted teens who had health care needs or other circumstances creating challenges for them in school and daily life. It was a wonderful learning experience, working with amazing students, dedicated teachers, and other community leaders. In December 1990, I returned to UI Hospitals & Clinics as clinical director of pediatric nursing. As the organization has grown and changed, so has my role. I love working in an academic health care setting. It’s challenging, it’s innovative, and there are many opportunities for learning and collaboration. I am grateful to be involved in caring for children and families and impacting the health and well-being of children’s health care. UI Stead Family Children's Hospital is an amazing environment to be a nurse. There’s a sense of inquiry and learning. How has nursing changed during your career? The scope and complexity of nurses’ work has grown. Nursing is evidence-based and requires critical thinking. Our children’s hospital nurses are strong leaders and key members of the health care team, and they support family-centered care. What makes our children’s hospital special? The children and their families make it a special place. The kids are truly amazing. It’s a privilege to be involved in the health care of families from Iowa and many other states and nations. What would you like people to know about our new hospital? It’s going to be an extraordinary place for children and families who need our care. The environment is centered around the patient and family. It will support comfort and healing, as well as fun for the child. The new hospital will also be an excellent place for nurses to practice and for interdisciplinary collaboration. I feel fortunate to work with so many excellent nurses, physicians, therapists, and other staff, as well as the patients and families we serve—their stories are very remarkable and meaningful. Nursing is a great profession for men and women. The opportunities in nursing are broad and exist across the health care continuum—in hospitals, clinics, community agencies, businesses, research, education, and more.